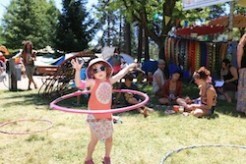 High Sierra is passionate about family and we want to make the festival experience memorable for all ages. We invite children and big kids alike to enjoy and participate in a myriad of engaging activities and performances taking place all weekend long. We try to create a quieter and more kid-friendly environment in the eastern end of the Shady Grove campground (quieter late at night, louder early in the morning). 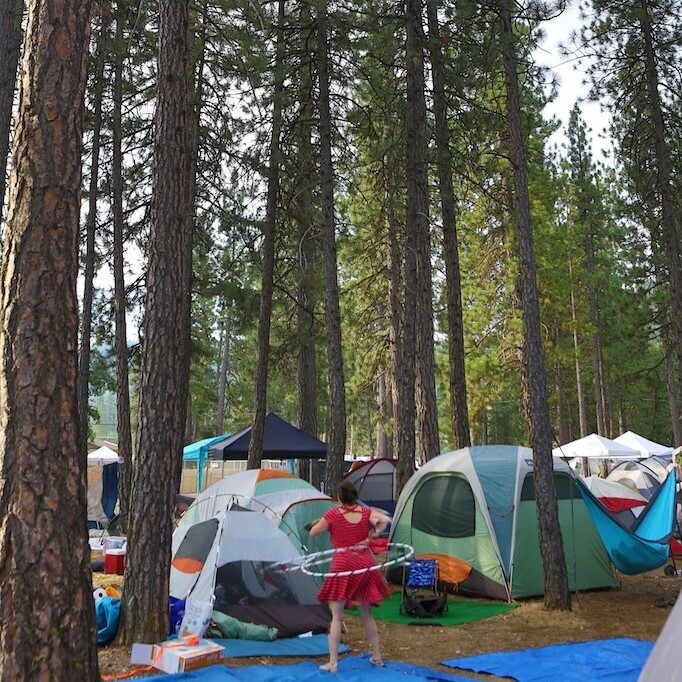 If you’re interested in camping in Family Camp, let your shuttle driver or parking attendant know and you’ll be pointed in the right direction. An on-site vehicle pass is required to park in Family Camp. Visit Camping and Parking for more information. The Rockin’ Nannies are a group of highly qualified educators, professionals and child-care providers who are back again to offer their services at High Sierra. They will be hosting a Rockin’ Slumber party from 8pm – 4am in the Tulsa E. Scott building each night and will supply activities, snacks and TLC in a safe, fun environment while moms and dads enjoy some “grown up” time. Rates are $15 per hour for potty trained children and $10 per hour for each additional sibling. Reservations, while available, can be made at the Rockin’ Nannies booth across from the Family Village. The Rockin’ Nannies crew will be waiting to say hello at their Meet & Greet at 4-6pm Thursday in the Family Area. This is the best time to register early before they fill up! Giant Puppets Save the World is bringing an epic display of interactive parade art to 2018 HSMF! Come pick out a silly costume from the Goat Barn and hour before the parade starts or wear your brightest funkiest craziest regalia to puppeteer a giant silk bird kite, wave a silk flag, march inside a huge dog or don a backpack puppet. NEW THIS YEAR! GPSTW is bringing it’s very own dixieland New Orleans-style marching band comprised of Bay Area musicians! BACK THIS YEAR! In the Parade’s Goat Barn will be a Giant Puppet Maker Lab led by Parade Director, Toni “Tone” Mikulka. Come and connect with parade people or see it as it is all coming together. The 2019 Family Village Schedule will be published in the Spring. For an idea of what goes on the in Family Village, see 2018’s activities below! 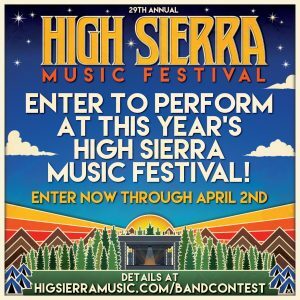 High Sierra is passionate about Family and creating a memorable festival experience for all ages. 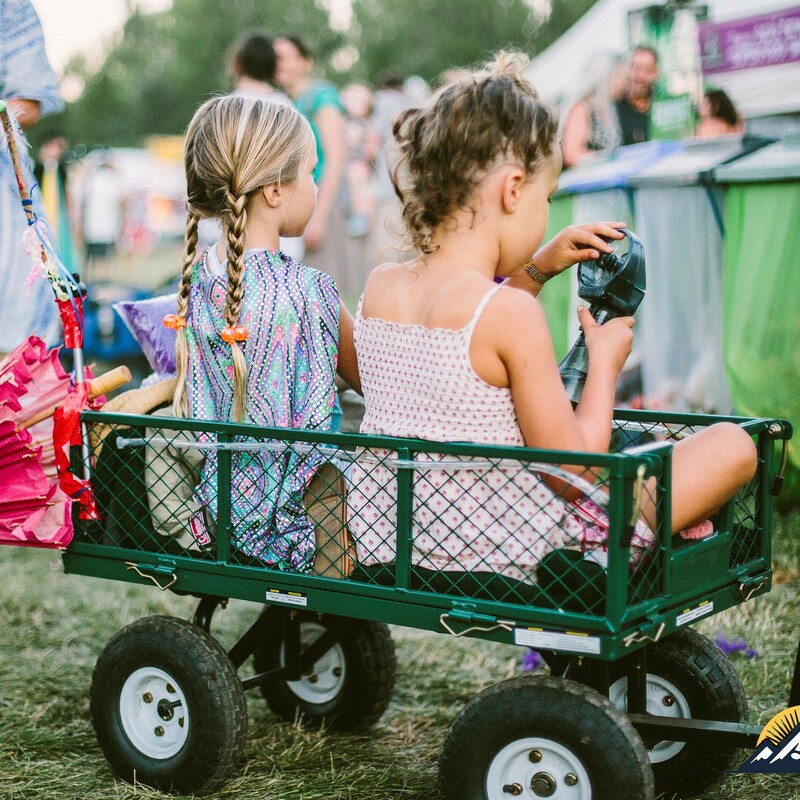 We invite children and whole families alike to enjoy and participate in all of our engaging, entertaining, and learning activities and performances taking place all weekend long in our Family Village. 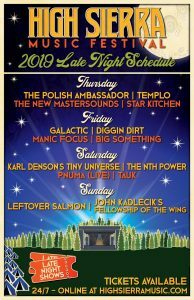 2018 highsierrafamilyvillage.sched.com.Log in and create your own custom schedule… there’s so much good stuff going on all day! Easiest to navigate if you choose “GRID” in view. The Family Stage will be in the Mineral Building again! (same space as the Troubadour Sessions). Heather Normandale of the Dandelion Family Band will host the Family Stage with her puppet friends. 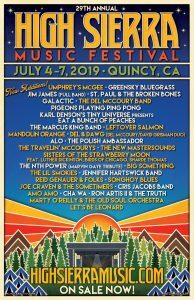 Each day is packed from 10:30am – 6pm with Sing-Alongs, Puppet Theater, Real Magic with Professor Merloch Silvermaine, Puppet Plex, and several “main stage” acts including Steve Poltz, Nathan Moore, and Bo and Lebo of the Bumpity Bumps! 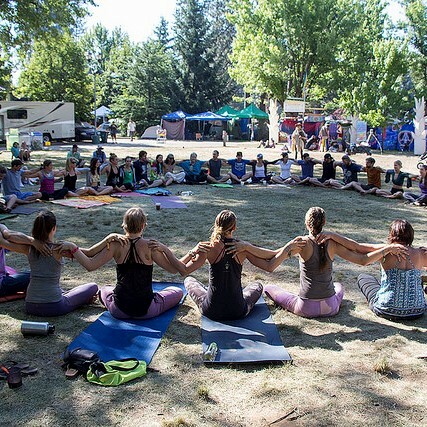 A zone for more relaxing activities including Family Yoga each day at 9 am and noon. With plenty of pillows, books, board games and etch-a-sketches you can have some off-the-beaten-path down time anytime of day. Breast feeding mothers and over heated kids welcome. Friday and Saturday 4:30-6 pm we will have Ukulele workshops for beginners to advanced. Bring your Uke and maybe even start a band for the Talent Show! “Beyond Bottled” tasting of Feather River water chilled with baby ice balls. Mixing and serving up the best cold water in California for kids of all ages. Bring your own bottle to refill and let’s save on waste! 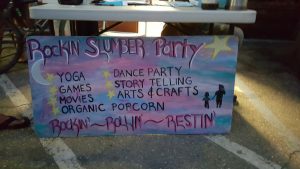 Cruise the kid-friendly vending area with Body Airbrushing by the Mad Crafters, and other quality vendors to get your own unicorn horns, set of wings, glow in the dark supplies, great handmade kids clothing and more! Also come see Bob’s Red Mill’s booth! Many of our Family Village patrons have been practicing all year for the upcoming talent show, and others will spontaneously find their talent just as the show begins with sign-up’s. All talents are welcome, song, dance, humor, perhaps something we have never even thought of as a talent before! Sunday at 3pm. Family Village is excited this year to host both Steve Poltz (Fri. 4:30 pm) and Nathan Moore (Sat. 4:30) These main stage artists both have touching shows for Families. You’ll want to come early as we pack the house! 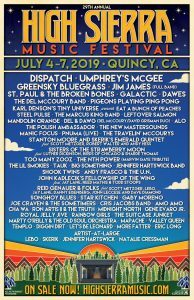 View the 2018 High Sierra Family Village schedule & directory. A famous collaborative family band formed at Sunset Co-Op Nursery School in San Francisco, and quickly topping the charts in the Family Village, the Bumpity Bumps always draw a crowd. Come grab your seat early! Rockin’ guitar daddies Lebo (ALO) and Bo Carper (New Monsoon) are joined by the incredible mother/son team of Laura and Shane Ossa. This year there will be even more special guests! Circus Luminescence is an innovative performance art troupe that specializes in juggling, stilt walking, hula hooping, magic, clowning, aerial dance, and a wild sense of humor. Combining their comedic wit, award-winning technical skill, and state-of-the-art-technology, their shows are great for all ages. They offer knee-slapping vaudeville variety extravaganzas, awe-inspiring fire performances, illuminating L.E.D. glow shows, and ambient performers. Circus Luminescence is a treat for the eyes, ears, and soul. The children point to a pocket and through story, verse, and song the puppet comes delightfully to life. Her gentle puppetry not only engages children but adults as well. Come shake and groove with music that makes you move, featuring singer/guitarist Pamela Parker of Pamela Parker’s Fantastic Machine. They will lead the group in rhythm exercises, call and response, improvisation, and some fun songs you can sing along to with your kids. This workshop is fun for all and provides the Family Village a music party of their own. Bring yourself and your Little Bears out for some fun music and movement! 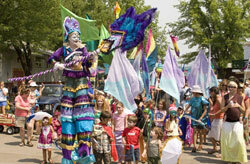 Quircus is Quincy’s community circus consisting of stiltwalkers, dancers, hula-hoopers, acro-balance performers, aerialists, jugglers, dancers, fire spinners, belly dancers, sideshow acts, singers, musicians, and poets. They are entirely made up of volunteers who donate their skills to entertain and embrace every chance to share the magic of circus arts. Do you believe in magic? Once you see Professor Merloch Silvermaine work his wizardly spells, we’re betting you will. In a review of Professor Merloch Silvermaine’s performance, The San Francisco Chronicle wrote, “With Silvermaine in control, the mood shifts from amusing to amazing.” He is Magician Member of the Academy of Magical Arts in Hollywood, and many magical authorities believe he was the inspiration for a certain wizard in the Harry Potter series—he spent 12 months as Visiting Sorcerer at the Hogwarts Academy of Witchcraft and Wizardry where he taught Spells and Divinations, and carried out research into advanced magical techniques, and the relationship between Magic and Emotion. Heather Normandale has made it her mission to inspire thru music. She even did an entire west coast tour on a bicycle in 2016. Heather will host our mornings this year with her special puppets.